The state also sports this charming flag. Mississippi, where public officials are occasionally elected by drawing straws, is apparently home to another charming political quirk: When state officials retire, they can take all the leftover money in their campaign-fundraising accounts with them. A recent review by the Associated Press found that, of the 99 state officials who retired in the past few years, as many as 25 pocketed more than $1,000 in the process, and at least four took more than $50,000. 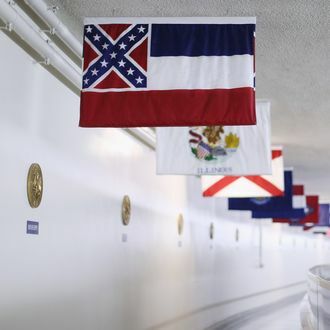 Mississippi is one of five states — along with North Dakota, South Dakota, Wyoming, and Virginia — where these sorts of withdrawals are legal, as long as state and federal income taxes have been paid on the sum. Some do use the money for personal expenses — Dale, for example, said he took it to support his autistic granddaughter. Others, like current Mississippi governor Phil Bryant, say they plan to spend the leftovers on other political candidates and nonprofits. Some take it to counteract the expense of running for office in the first place. Whatever the reason, running for office in Mississippi, winning, and pocketing thousands of donor dollars sounds like the world’s best retirement plan.